I’ll never forget my first camping trip. I was six years old at the time. I ventured into the forest a boy, and emerged a man. I was the self-proclaimed King of the Forest, and I didn’t need a homemade crown of antlers and eagle talons to prove it. I just wore one anyway. And now that I have a son, I figured it’s never too early to expose him to the untamed wilderness. Since he’s only four months old, I contemplated some sort of warm-up prior to a real camping trip. Originally, I thought about pitching a tent in the back yard, just to see how he survives at night amongst all the dingoes and gypsies that live in our neighborhood. I decided against it. This isn’t meant to be a vacation. It’s a camping trip. It’s about survival. And ultimately, I decided the only way to transform him into a man is to drop him off in the wilderness alone and let him fend for himself. Well, he won’t be entirely alone. I’ll let him borrow my Rambo knife, you know, the type that stores matches and fishhooks and a compass in the handle. So he’ll have a survival knife. And of course, we’ll dress him in camo as well. And the rest will be up to him. Sure, it will be dangerous. Especially since he can’t crawl yet. I think that will really help him build character though. If a cougar attacks, he won’t be able to just run away from his problems. He’s going to have to deal with it head-on. I can feel it already; he’s going to learn some important life lessons on this trip. It will be cold too. I generally don’t let him play with matches, so he doesn’t have much experience with fire. Consequently, there is a good chance that he might start a forest fire. That’s ok though. I almost look at it as a rite of passage. Of course, his mother doesn’t know about any of these plans yet. But that’s the idea. I’m already concerned that she’s babying this baby too much as it is. It’s time for him to become a man. And we’ll begin that process tonight by leaving him alone in the wilderness. And when I see him again in a few days, hopefully he will emerge as the new King of the Forest, unshaven, well-fed and draped in animal pelts, just as I was, 22 years ago. 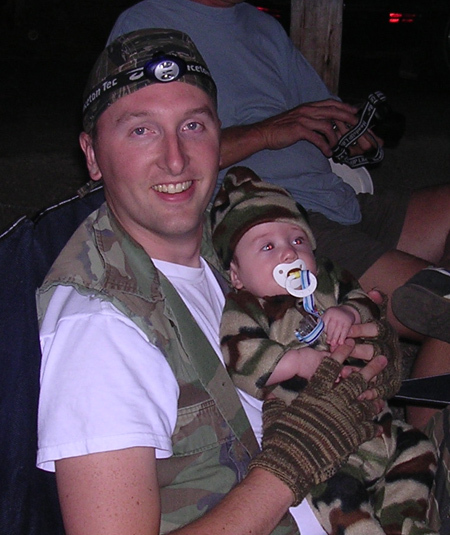 Here’s a shot of Charlie and I in our respective full-camo attire. On a related note, I’m in the market for a matching baby-sized pair of camouflaged fingerless gloves. If you run across such an item, let me know. I took a similar tact with Aiden, the whole baptism by fire thing. Except, instead of putting him out in the wilderness, at six months I put the vacuum cleaner in his hand, turned it on, and ran like hell. Later, walking across my spotless carpet I gave Aiden the lighter and a slab of meat and pointed him toward the BBQ. I still remember the smells emanating that day… Perfectly cooked meat, the air rushing through the lilies, and slightly charred baby clothes. Thankfully there weren’t any lasting scars. Three months later I’d molded our new butler, just like I’d always wanted. While you are at it, I think you should try to enhance Charlie’s sense of smell because I keep looking at that picture to the right of the dog with a bird in it’s mouth and I can’t help but imagine a tiny baby being trained to perform the same function. Picture it, a helpless child rooting around on the ground, his nose pressed to the dirt when pwang! one leg shoots out and then he bounces off into the high grass only to return with a fresh kill in his teeth. Houndbaby. If everything goes perfectly on this voyage into manhood then little Charlie will come out of the forest as the beast master. A ferret on one shoulder and an eagle on the other. I can just see charlie emerging from the depths of the forest. Who said parenting was hard. It obviously is a simple process of exposing your child to every highlight of your childhood. Well done dad. you know you couldn’t “survive” a camping trip without getting liquored up the second you drove a stake into the ground for your tent. i’ve seen and learned from your methods. let’s wait till charlie reaches the proper drinking age. 17.
btw, i didn’t know an oversized white tee could go so well under a horribly cut sleeveless camouflage “vest” (if that’s what you call it) with a matching doo rag, miners lamp, and unmatching fingerless gloves. nice ensemble!